In honor of this Memorial Day weekend, I am expressing my hope for freedom and peace, with liberated string quilting. I have always believed that each of us is connected by energetic and spiritual heartstrings and that those heartstrings stretch and reach between each and everyone we love or have loved, whether living in this physical dimension or not. My belief is that any kind of quilt made with strips and strings... of any kind, represents the heartstrings between myself, as the quilter, and those I then give the quilts to. I have always loved piecing with strips and strings and with heart-felt and love-filled patchwork! 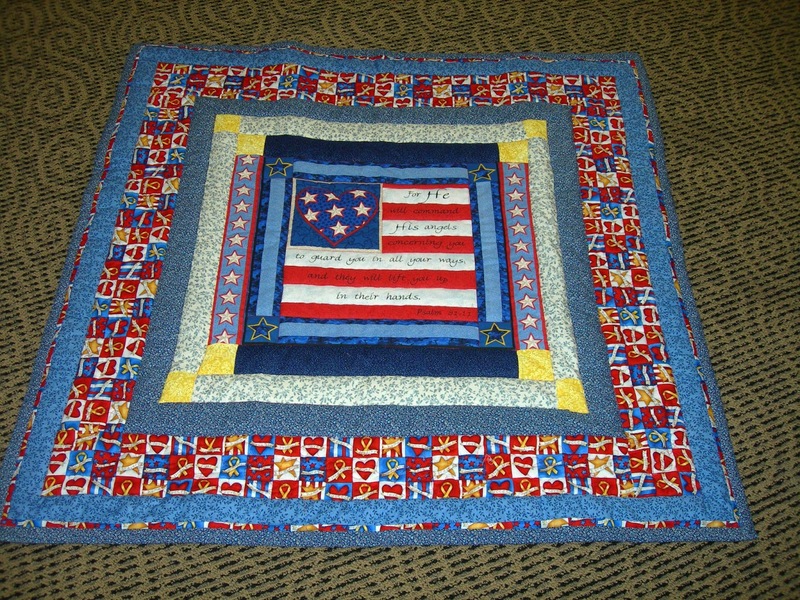 I joined in the fun of creating my own patriotic quilts using the liberated string quilting that goes back in time to many of the earliest quilters and brought into more modern times by such quilters as Gwen Marston and Evalyn Sloppy. 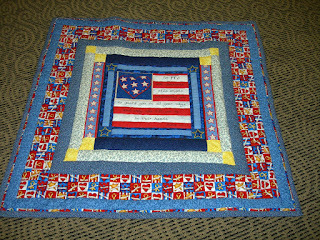 My own patriotic quilts have been primarily donated to wounded veterans at Madigan Army Hospital in Washington state, the Veteran's Hospital in Portland, Oregon and to the Salem Veteran's Outreach Center, here in Salem, Oregon. My patriotic strings are the most popular and have been overwhelming loved and well-received. But I do love string quilting of any kind and have made a number of string quilts in a lot of variations! By simply cutting foundation blocks out of scrap fabric, one can add strips and pieces of varying sizes, piece by piece until the block is 'all filled up.' To create a pattern in the final quilt top, I am using blue for the first center strip. But any repetitive color can be used as an anchoring strip. Pressing each strip flat after each one has been added in to your string quilting block! 7. Finally, you would attach block seams in rows as desired, using additional strips to fill in size differentials around center panels or other additional blocks, sashings or cornerstones. strips like stripes, logs, or versions of log cabin strips around and around a center square...with or without foundation fabrics if not pieces on the diagonal bias. Join in and try this today, it's great fun and a wonderful way to create heartstrings between you and a loved one! I've made patriotic strings, potholders, bags, pillows.....you name it..for both gifts and donations to veterans! And of course, strings don't have to be patriotic, though they make up so quickly for donation! I've made many other patterns for donation in all the colors of the rainbow! And they don't have to be complicated! Use the same foundation piecing onto a piece of batting and you have a simple horizontal strings baby quilt, as shown above! I've got just 16 blocks done so far but hope to get more done tomorrow. My son has been here visiting but I've been stealing away now and then to make a few blocks. I make lots of string quilts, but I've never thought to put in a non-string focal block as you have done. What a great idea! Fab quilt! I"m a huge fan of log cabins and anything made with bits and strips, so this is wonderful! Thank you for sharing those great sites! I really must give this a try. Thank-you for the clear instructions you have provided us.